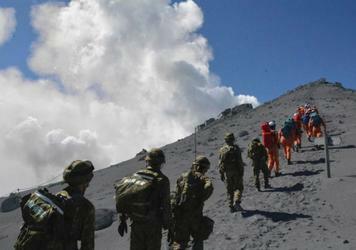 TOKYO, Japan, September 29, 2014 (ENS) – At least 31 people may have lost their lives as the sudden eruption of Mount Ontake in central Japan Saturday took climbers by surprise, trapping them near the summit. 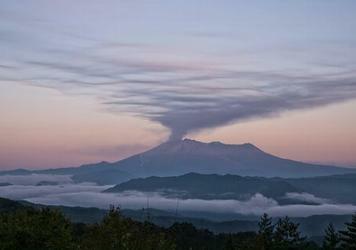 The volcano, Japan’s second-highest at 3,067 meters, erupted without warning before noon on Saturday. The eruption is continuing, but the official search for survivors was interrupted Monday afternoon after toxic hydrogen sulfide gas and volcanic ash from the volcano forced rescuers back to safer ground. Prime Minister Shinzo Abe Sunday ordered Japan’s military to mount a rescue operation. Over 540 police, fire department and Self Defence Force personnel were participating in rescue operations Monday morning at Mount Ontake on the border between Nagano and Gifu prefectures when they were threatened by gas and ash. Police said at least 24 bodies of people remain near the mountaintop after it erupted without warning on Saturday, overwhelming climbers visiting this popular destination to view autumn foliage. The number of people still stranded or missing is unknown; some climbers have made it down the mountain on their own. “This was a steam-driven [eruption] and it has been said it was extremely difficult to predict,” said Suga. About 200 people were descending and arriving in safe areas one by one, he said. More than 250 people remained trapped on the mountain’s slopes Monday, said a Nagano prefecture police spokesman, who did not give his name in accordance with policy department policy. Japan Meteorological Agency officials say that volcanic ash could fall within a radius of four kilometers from the crater and lava flow could erupt. They have warned the public to stay away from the area. On Monday morning smoke was rising 500 meters into the air and drifting east. Soon after the eruption began on Saturday, smoke reportedly rose to 7,000 meters. Agency experts say volcanic ash has fallen in wide areas, extending from Gero City in Gifu Prefecture on the western side of the mountain, to Kofu City in Yamanashi prefecture on the south-eastern side, reports public broadcaster NHK TV. The deadly eruption of Mount Ontake will not affect the scheduled restart of the Sendai nuclear reactor, which is in a separate volcanically active area, Suga said Monday. One of more than 100 active volcanoes in Japan, Mt. Ontake erupted most recently erupted in March 2007.